Merck and Pfizer are discontinuing the Phase III JAVELIN Ovarian PARP 100 study evaluating Bavencio (avelumab) in advanced ovarian cancer, signalling yet more disappointment for the PD-L1 immunotherapy. The trial was looking at Bavencio in combination with chemotherapy and followed by a pairing with Pfizer’s PARP drug Talzenna (talazoparib) in previously untreated patients with stage III or stage IV disease. The decision to discontinue was based on several emerging factors since the trial’s initiation, including interim results from the separate JAVELIN Ovarian 100 trial announced in December showing that Bavencio was unable to improve progression-free survival when used as a maintenance therapy. That failure came just a few weeks after Merck and Pfizer conceded defeat in another phase III study of Bavencio, the JAVELIN Ovarian 200 trial in platinum-resistant or platinum-refractory ovarian cancer. The companies said that the results from JAVELIN Ovarian 100 do not support continuation of the JAVELIN Ovarian PARP 100 trial in an unselected patient population and “emphasises the need to better understand the role of immunotherapy in ovarian cancer”. Additional factors include the “rapidly changing treatment landscape” and the approval of AstraZeneca’s PARP inhibitor Lynparza in frontline maintenance of ovarian cancer, meaning that the trial, which was using Avastin maintenance in the comparator arm, was no longer testing against the standard of care. This also meant it would be unethical to continue to deny patients in the Avastin arm access to Lynparza. Merck and Pfizer stressed that the decision to discontinue the trial was not made for safety reasons. 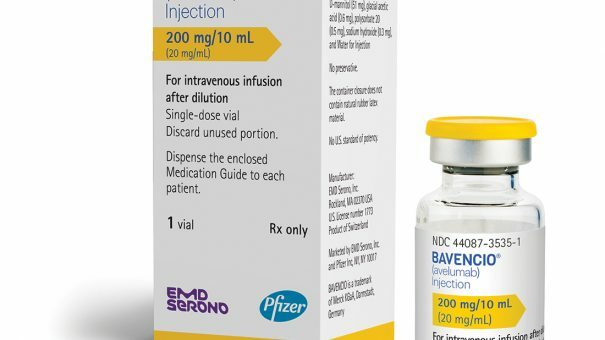 This is not the first indication that Bavencio has missed the mark in – it failed a trial in second-line non-small cell lung cancer (NSCLC) in February last year and in third-line advanced stomach cancer treatment in 2017. The slew of disappointments put Merck and Pfizer in a difficult position in the immuno-oncology space, where Bavencio trailed Opdivo, Keytruda and Tecentriq as the fourth drug to come to market, and has continued to lag behind its competitors. But the companies said they are forging ahead with “at least 30” other JAVELIN clinical programmes evaluating the drug across more than 15 different tumor types, including breast, gastric/gastro-esophageal junction, and head and neck cancers, Merkel cell carcinoma, non-small cell lung cancer, and urothelial carcinoma. Last month the FDA began a speedy review of Bavencio (avelumab) in combination with Pfizer’s tyrosine kinase inhibitor Inlyta (axitinib) for patients with advanced renal cell carcinoma, the most common form of kidney cancer.